I never would have imagined how much junk a newborn would need. I mean, seriously. That tiny person needs like four million diapers, two cases of wipes, nineteen pacifiers, two bookshelves full of books, forty-five burp cloths... you get the picture. It's like my house has turned into baby clutter central! Recently, I was asked by Rubbermaid to review their new product line- a set of fabric storage boxes suited to help you organize your junk. Um, yes, sign me up. It's as if the organization fairy came a-callin'! I was a happy camper when I received the product in the mail. These ain't no regular storage boxes, that's for sure! The Rubbermaid Bento organization line comes in boxes in varying sizes, which I love. Each box has a lid topper that is reversible- you can snap them on like a regular lid or turn them upside-down to make sort of a tray table. Very cool. 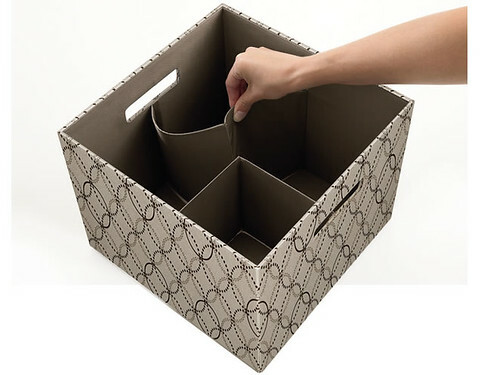 But my favorite part are the little flex dividers that are inside the boxes- you can flip them in to store large items or flip them out to organize small items within each box. Genius! I've got the boxes in my living room, storing all kinds of fun baby items. The flex dividers are great to separate rattles from blocks and blankets from burp cloths. If you're interested, you can find the Rubbermaid Bento line at Jo-Ann's Fabric and Craft Stores. Or, you can enter to win a set of your own right here on Ten June! 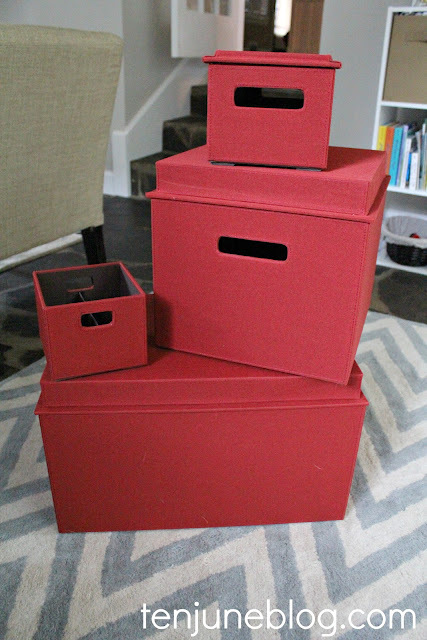 G I V E A W A Y : To enter to win a set of Rubbermaid Bento fabric organizational boxes (valued at $215.93), simply leave a comment on this post telling me what you need to organize around your house! For additional entries, follow @Rubbermaid on Twitter or like Rubbermaid on Facebook and leave a comment on this post letting me know you did so. Please note that Rubbermaid will only ship the product to the U.S. and Canada. You must be a follower of Ten June to enter! This giveaway closes at midnight on Sunday, October 21, 2012. Sample provided free of charge by Jo-Ann Stores, Inc. and Rubbermaid. Please see our legal letter for additional details. Oh, I feel like my house has morphed into piles of paper everywhere. We just bought the house and got married this spring, but already clutter abounds. I think probably the office or den could use these boxes the most, but so many uses for the Bento's!! Just liked Rubbermaid on Facebook too...so here's hoping that today's my lucky day! We just bought a house and I'm still trying to organize things in the new place. I had some great systems set up in our condo but they just don't work with the layout of our new home. So, spaces that need some organizing attention are my office, the master bedroom, my husband's office, the living room, pantry, mail/papers, table linens & decor, the kids' room, and the entryway. So pretty much the whole house. I would love to organize my sewing supplies. The pantry and under the bathroom sink immediately come to mind! My husband and I both work from home AND we have a 1 year-old boy :)...so the hardest part would be figuring out what to organize first! I need to organize my fabric stash and craft supplies! I need this to assist in organizing my kids' rooms. THey seem to collect more and more and more STUFF!! I need to organize everything!! But the top 2 areas are my craft supplies and our toddlers toys. I desperately need organization for all of my boys' toys! Thanks for the chance to win. Those look great! I would love to get all of my craft stuff organized, or the laundry room! My tween daughter's room DESPERATELY needs some organization. I also liked Rubbermaid on Facebook! 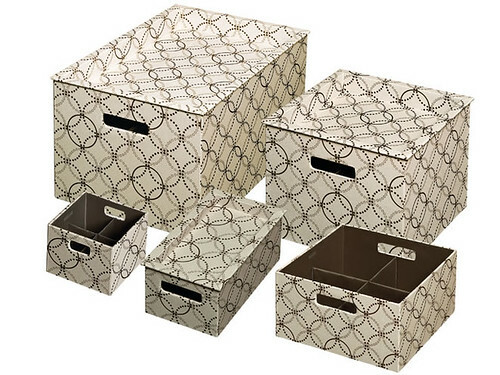 These boxes would be perfect for organizing all of my family's electronic cords and devices! Thank you for such a great giveaway! I need to organize all my kids artwork and extra school supplies for the year. I would use these to organize my closet- flip flops, ballet flats, long sleeve shirts, clutches... it's madness in there. I am a follower of Ten June and a new Rubbermaid Twitter follower for an extra entry! I need to organize... everything! Mostly office supplies and toys. My closet is a disaster zone - these would be perfect for organizing belts, scarves, and all kinds of other closet loose ends. I need to organize my craft supplies! Currently I have one large box, but I would love to sort things into categories for easier access. I also have a new baby and his stuff to organize! I am in the same boat as you...LOTS of baby clutter around here that needs to get organized. Plus, we just moved and went from having 4 hall closets to only 1! Thanks for hosting this giveaway! 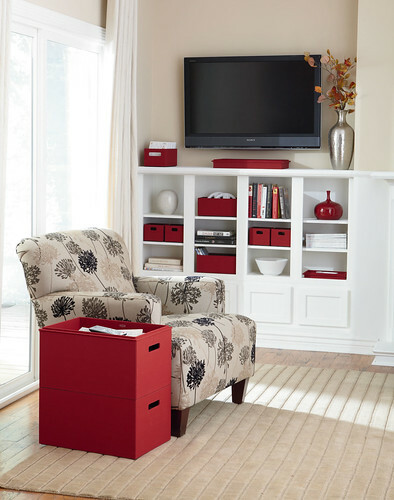 And I just liked Rubbermaid on Facebook! We are out of the baby clutter stage at my house, but still have plenty of big kid clutter. School papers, books, toys - our playroom needs major organization! Love these! I really need to organize every room in my house! My office is a Disaster and needs some serious help!!! I'm starting a craft room in our former guest room (who are we kidding, we have never had anyone over to spend the night and a bed takes up a lot of space!). I would love these to help with the organization of fabrics and glue and whatnot! I've got a baby on the way, and want to get a head start on all that clutter! I have a 7 week baby boy, so I need to corral the same stuff....all over my house! i can always find something to organize! i would start with my closet though! I, too, need to organize a nursery! I also need help with organizing everything for my 1 year old daughter!! My husband works from home so this would be great for corralling and organizing his stuff so it wasn't taking over our living room...which apparently is also an office! We are expecting our first baby in April, so I will definitely need some help with organizing all that we'll be purchasing for the little guy or gal! I need to create an organized office in my guest room. This would be a great tool! I need organization in my officve that has yet to be put together! And also for my bathroom cabinets - not sure where I would use these yet! Various toys and kid junk! For our 2 1/2 year old now, and even more so when #2 is born in January! We just bought a new house and now that I have a pantry, I need to get that baby organized. I need to organize my office, its a hodge podge and can't stand it anymore! !These would be so GREAT!! My basement really needs some organization. We just throw stuff down there and I could use the bento boxes to help sort and store everything. I would use these thru out the house but would probably start in the bathroom. It needs help immediately. Thanks for sharing such a generous and wonderful giveaway. I need to organize all of our office items that are piling up! What a great giveaway! I would use them to store the random office supplies and odds and ends that clutter up my living room/kitchen. I just "liked" Rubbermaid on FB too! Thanks! I need to organize EVERYTHING in our house--especially the kids' stuff! I also followed Rubbermaid on Twitter and liked them on Facebook. I also need to store a ridiculous amount of baby items! We have a baby due in January and for the time being my husband and I (and our hound) will be living with my parents! So needless to say we have NO storage for when the LO comes. I need these boxes! I have 11 kids and I have sooo much to organize. I love these boxes! There's so much to organize around my place but I think I'd start in my closet . . . or maybe my utility closet. Thanks for hosting the giveaway! I've been a follower of your blog and I just liked Rubbermaid's FB. I could use these for some closet organization at my house! They are gorgeous! Trust me, if you saw laundry room you wouldn't be doing a giveaway, you would just be giving these to me! haha I could also use a few boxes to designate as a place to hide all of the things my boyfriend seems to leave around the house. Thanks for a great giveaway! I need boxes for all of my craft and DIY items...they are out of control!...and I am a follower of your blog and I love it! I liked Rubbermade on Facebook! Um, yes please! I have a brand new shelving piece that is begging for these boxes... goodbye random piles of mail, tools, cleaning supplies, batteries and office supplies! I just moved and need to organize my closets and photos! Badly!! My sewing and craft room could use these so much. Also my jewelry is a mess. Thanks for the chance. I also need some help with all the baby stuff. My 6 month old has more stuff than I do (I think). Hi there - I need to reorganize my growing stash of fabrics!! Also, I liked Rubbermaid on Facebook! I need to find something to help organize mail and coupons and all the other loose papers that seem to pile up on the kitchen table. I have a 6 month old baby and we just seem to keep accumulating more and more things that are in desperate need of some organization! We need to organize our office. Our office and craft room! The hall closet...little mittens and hats for 2 crazy littles are hard to keep track of. I need to organize my school stuff. I decided to go back for my masters and I've got books, papers, and pens all over the place! I need to organize my crafting stuff! Those little pop-out organizers?! perfect for small stuff! I need to organize baby gear as well. And toddler stuff- it doesn't get better as they get older!! Office, craft room or baby's room. With a giveaway like this I might be able to get something for all 3 rooms. Woohoo! I need help organizing my office space - badly! Woo hoo!! My home office/craft space is in dire need of organizing!! Fingers crossed, Michelle, thanks for hosting! I need to organize everything!! But my first priorities are probably my little ones' toys and then all of our family fun crafting supplies. This looks great! I would love these for my two-year-olds toys! So many little pieces and not enough storage! I need to organize the abundance of toys and all of our Wii stuff, office supplies, craft supplies, all the chargers and cables for our electronics...and much much more! I liked Rubbermaid on Facebook! I'm expecting a little baby bean soon and would most certianly need these to hide/organize all of the baby stuff! Following @Rubbermaid on Twitter now! I would love these for all of our toiletries currently housing the majority of our linen closets. Well, you are a source of never-ending inspiration! You have shown the boxes off in a beautiful and functional manner! These are great - currently, in our cabin, we do not have any cabinets - they would be functional and attractive storage for our linens, clothes, dishes, etc. We're expected a little boy in December and I know I'm going to need help keeping everything organized! Oh boy...what doesn't need organizing around my house. I have three kids and a husband (sorry dear). As the kids get older and into school, the things I need to store/keep track off just seems to multiply. Oh I am in desperate need of some organizing help... these boxes are great, functional and fashionable :) Thanks for such a fun and generous giveaway!! Right now my organization project includes my craft room. I've been trying to find streamlined way to organize everything from scrapbook supplies to fabric to computer supplies. These boxes would be perfect! I'm working on getting my Craft Room re-organized - I've stopped doing paper scrapbooking (moved to digital), and want to get everything consolidated - lots of supplies that I'll hold on to for my 3 boys to use when we craft! I need some serious help organizing our office stuff. I mean where do people with these super simple desks keep their extra file folders and printer paper, etc.? We've got a big roll top and I don't seem to have room for it all along with all our files. I need to organize my craft room. It is small so it needs to be very organized so I have space to work. I really need to organize the living room and craft room, these would be perfect!!! My living room, so many tech things to store! Ummm... the better question is what don't I need to organize? Probably the biggest thing is all of the files that should go in an office (that I don't have!). I need to organize my shoes. I follow @Rubbermaid on Twitter. I definitely need some organization in my "craft closet"! These products look great! I need to organize the guest bedroom! I desperately need to organize the paperwork in my house. It is out of control! Paperwork, magazines, and the like has always been my downfall so I need as much organizational help as I can get with it! Thanks for the opportunity to win awesome Rubbermaid storage! I badly need to organize my fabric and craft supplies. These would be perfect. And I love the pretty colors. What can I NOT store/organize right now?? I'm moving Thursday from a 2500sf house to a (max) 1300sf house ... and I haven't packed a thing. Needless to say, there is going to be lots of storing/organizing going on!! Lord do we need some organizational help! We just moved and of course nothing Has a place like it did at the last house.. augh! Now I'm pregnant, so all the baby stuff will be coming back out! I could put these storage containers to some serious use! Oh, the laundry room, our closet, our bookshelves (I'm starting to think hiding the books would be better than displaying them, we have so many!). I could use these!